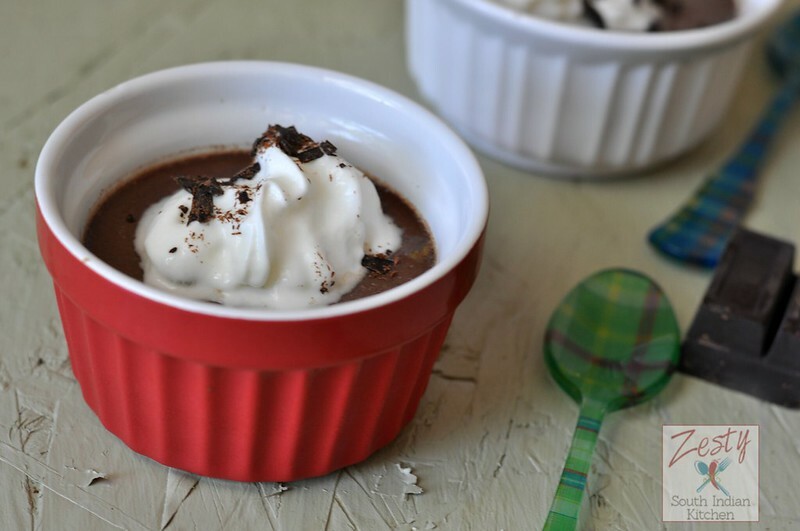 Delicious Chocolate Pot de crème an easy dessert for any time. Pot de crème (“pot of cream”) is a traditional French Custard typically served in a pot-shaped cup. 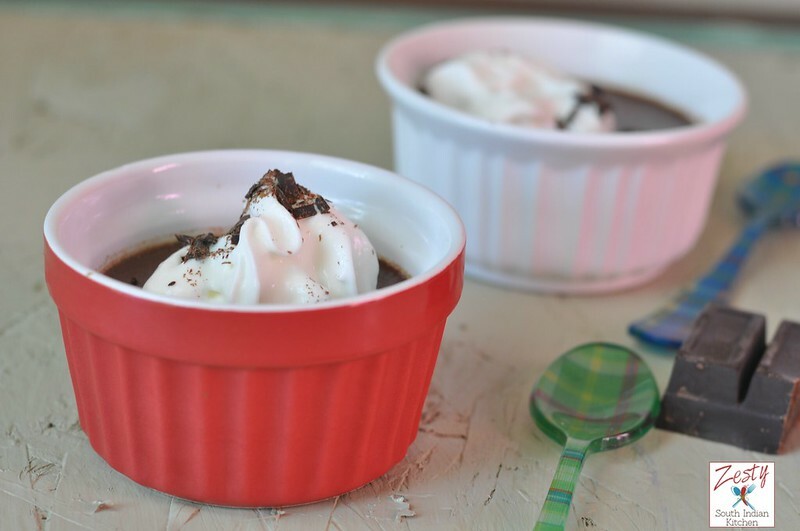 This month’s Baking Partner’s challenge was to make Pot de Crème as suggested by Tamy of Savory Kitchen Table. She suggested salted caramel pot de crème and cream cheese version. I am rooting to make that one at first, but afraid that my little ones won’t touch it, as they are only ones helping when comes to sweet. Hubby is staying away from sweets. So I tried this Chocolate pot de crème. Chocolate is the only thing I can use to lure my kids, that too the dark chocolate. They are not fan of milk chocolate, for them it is too sweet. They love sweet dark chocolate, so this weekend I made it. They loved it, even my 3 year old asked me to make it more. 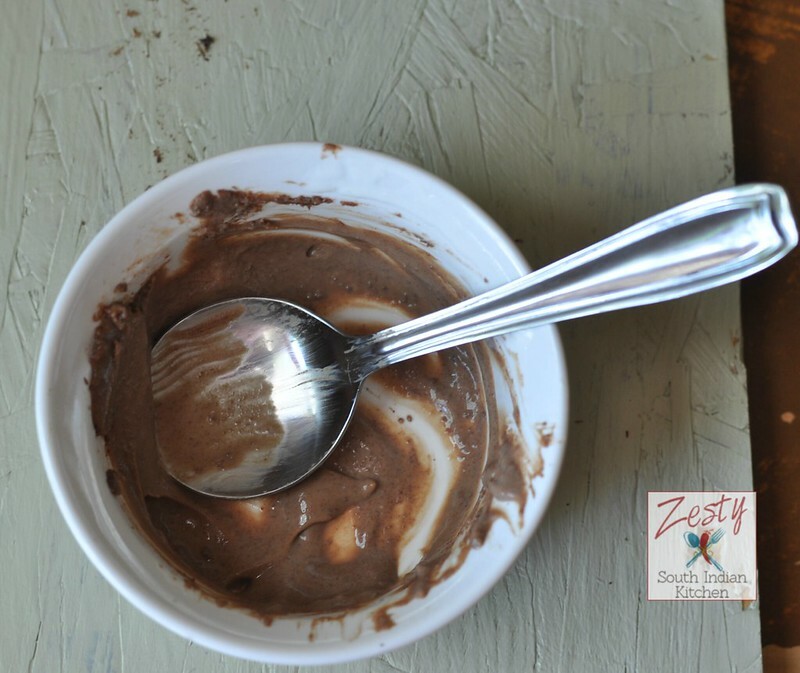 If you have good quality chocolate, yolks, heavy cream, milk and sugar, you can make this decadent chocolate delight. Only thing keep in mind is that you need to make it a few hours ahead before you can serve them. I have seen the recipes without the baking, but not ready to try it as I am giving to kids. Here are some interesting facts of Pot de crème; August 27th is National Pot de Creme Day. It is slightly set baked custard. It originated in the 17th century. Earlier, cups for pots de crème were beautiful and elaborately made, and numerous types featured two handles and a lid, or a single handle and a lid. Even today, there are some beautiful pots available that add much flair to presenting pots de crème, however most restaurant and homes are using simple ramekins to make pot de crème. I used my ramekins to make it. First just heat milk and cream then dissolve the chocolate and mix in egg and vanilla extract. Then bake them in water bath. Delicious chocolate pot de crème is ready. Top with little sweetened whipped cream and shaved chocolate. Every bite is smooth and luscious. You will go for next spoon I am sure. Please check the creations of other baking partners also. If you want to bake with us, shoot me an e-mail. You can join next month baking partners challenge. 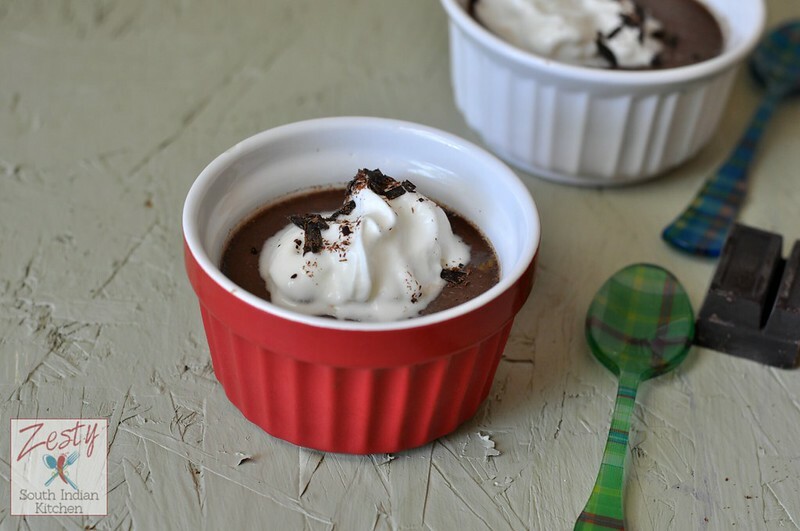 Delicious chocolate pot de creme an easy chocolate dessert for any party. Preheat oven to 325°F. Line the baking tray with aluminum foil this will prevent ramekins from moving while transferring to oven. Bring cream and milk just to simmer in heavy medium saucepan over medium heat. Remove from heat. Add chocolate; whisk until melted and smooth. Whisk yolks ,vanilla extract and sugar in large bowl to blend. Gradually whisk in hot chocolate mixture. Strain mixture into another bowl. Cool 10 minutes, skimming any foam from surface. Divide custard mixture among four 3/4-cup ramekins Cover each with foil. Place cups in large baking pan. Add enough hot water to pan to come halfway up sides of cups. Bake until custards are set but centers still move slightly when gently shaken, about 30-35 minutes. Remove from water. Remove foil. when you ready to serve make sweetened whipped cream with heavy cream and sugar and add a dollop on the top of custard with shaved chocolate. Wow, looks yummi! I am pinning it! This is such a fantastic dessert !! Loved this desert a lot… Delicious, yummmy. What a lovely dessert!! can i grab that bowl?? Swathi, it’s lovely! I love a small serving like that of something so rich. And I like to use a very small spoon and savor every tiny bite. This is sooo tempting Swathi, lovely dessert…. can i grab one of those? Oh this looks so yummy! I think I’ll need to make this as a yummy home date-night type of dessert for my husband and I! What a wonderfum chocolate pot de creme, Swathi! This looks utterly delicious! Pinning, tweeting and sharing on Facebook and Google!I simply love it! I could eat four of these in one sitting! YUM!